The manufacturer, Elenco Electronics, says Bredblox, but what's in a name? This is just a nice little breadboard for electronic experiments. The Elenco Model 9830 measures 6-1/2" long x 2-1/8" wide x 5/16" thick with (2) power busses up both long edges and (63) double rows of more busses. 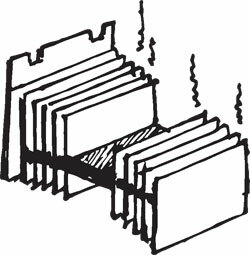 The holes for components and jumper wires are approx .050" each and multiple boards can be interlocked via tabs and ports on the long edges. Now go invent something and get rich. 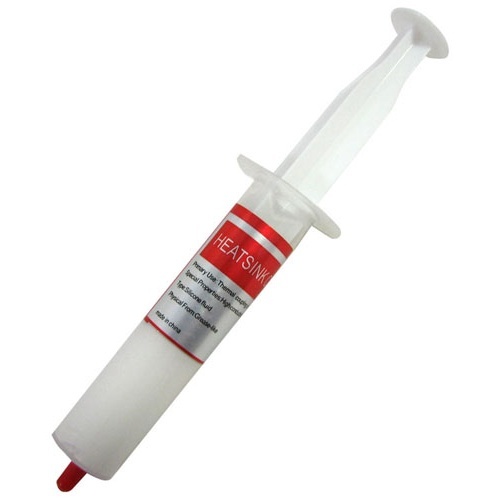 You get a 10ml syringe of white silicone heat sink compound for use as a thermal coupling for electronics. 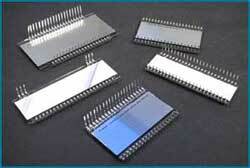 High conductivity, low bleed and stable at high temperatures. Perfect for you electronic tinkerers out there with a sinking feeling. 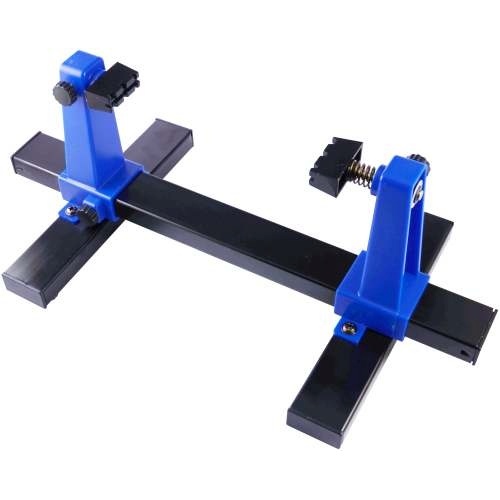 Like a third hand in the electronics lab, this circuit-board rack from Elenco® has a pair of stable 6-1/2" legs and 3" tall arms with clips, one spring-loaded, to hold the board. 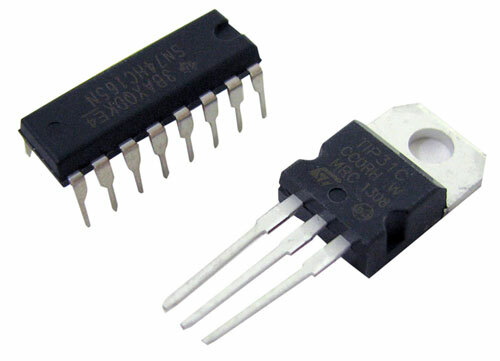 It's a must for any electronics DIY-er. 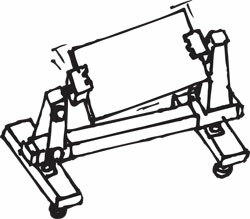 Adjusts from 0 to 9-3/8" apart and lets you rotate the board it holds a full 360 degrees. Both clips and legs lock with thumbscrews. 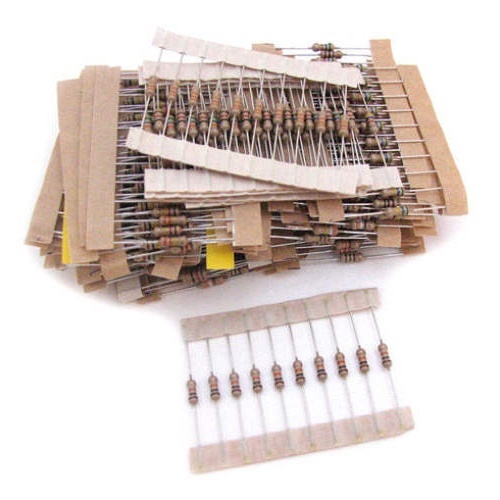 When you could just order this 480-pack of 1/4 watt, 5%-tolerance resistors. You'll get (30) pieces each of 10, 22, 47, 100, 220, 470, 1K, 2.2K, 4.7K, 10K, 22K, 47K, 100K, 220K, 470K, and 1M OHM. 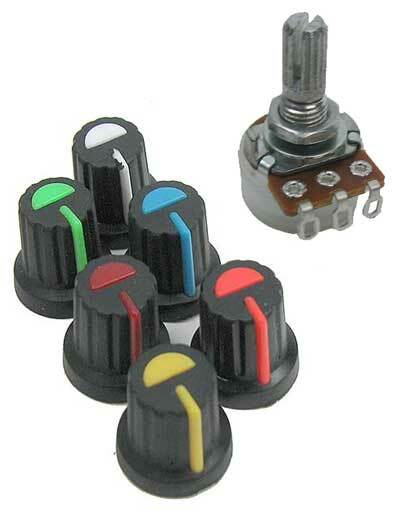 You pick the 500-Ohm 1/2W, 1K-Ohm 1/2W or the 10K-Ohm panel-mount potentiometer, all from Alpha Products® with dust covers over a 17mm base, panel tabs, 6mm dia x 10mm long shafts, and 3mm solder lugs with washers and nuts. 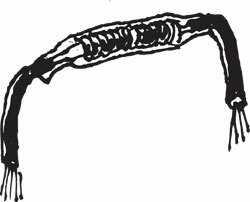 Shafts are knurled and slotted, and single-turn. Turn them with press-fit black plastic knobs, 6mm ID x 16mm dia x 18mm tall with pointers in assorted colors of red, orange, yellow, blue, green and white. 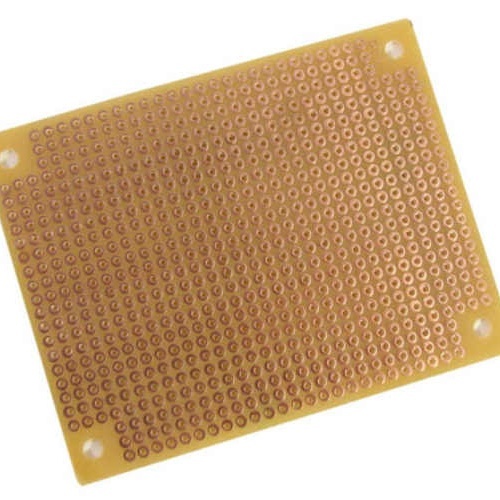 This solderable perf board for the electronics hobbyist measure 1-1/2” x 1-3/4” x 1/16” or 3-1/4" x 2-1/2" x 1/16" with 1mm dia copper pads on one side with holes sized for component leads. Has 1/8" dia mounting holes on the corners. 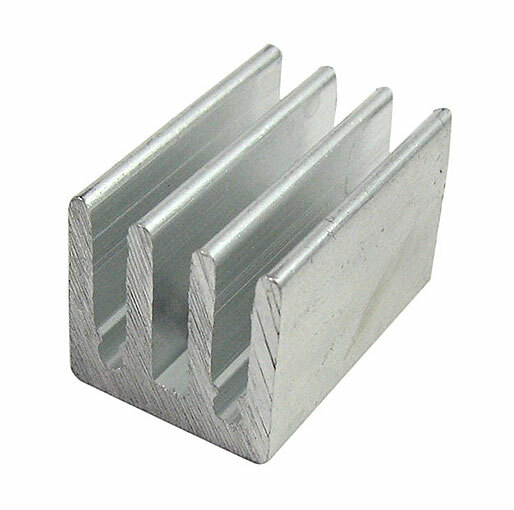 This little aluminum heat sink measures 1" square x 5/8" with (4) 5/8" tall fins and a threaded 3/32" bore. Got Heat You Need Sinking? 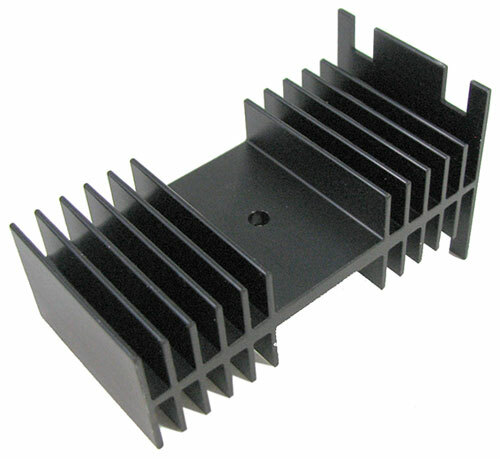 This black aluminum heat sink measures 4" x 2" x 1-1/14" with a 2" x 2-1/4" base. (6) 5/16" thick fins at the top and a set of (5) more at the bottom above the base. 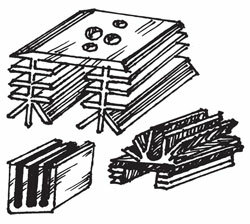 In between the fins is a 1-1/4" x 2" space for your chip with a 1-1/8" square thermal pad and a 3/16" bore. These liquid crystal displays are raring to go. As soon as we can get Mary Ann to stop playing with them we'll pick out (5) assorted displays for you. (She keeps zapping them with static electricity to see what pops up. Mary Ann is easily amused.) Sizes range from 1-3/16" x 2" to a few as large as 5" x 10". They're unused. 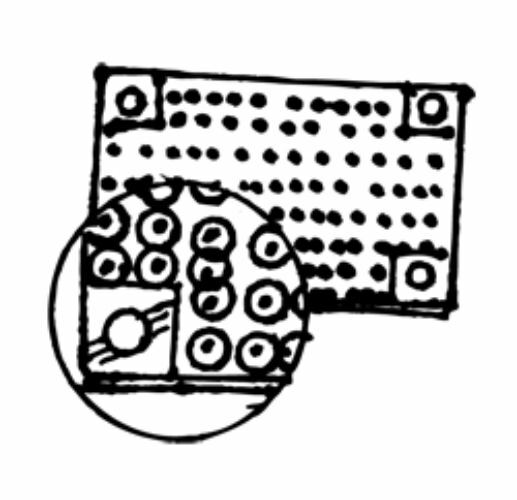 Some have pin leads, some have traces right on the wafer. Either way, they're a terrific bargain. 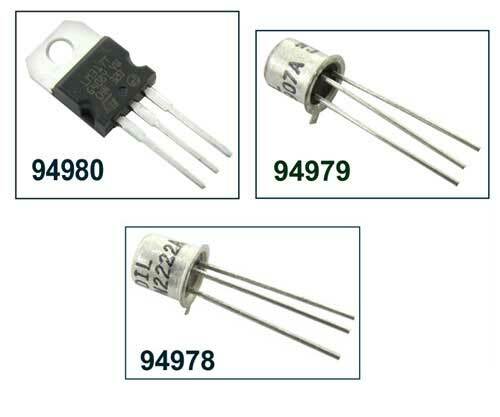 We searched the world over to find a good source for the most popular transistors. Success! Check out our listing and pick your favorite. Click the item to view the pin outs. Ten dozen, to be exact. 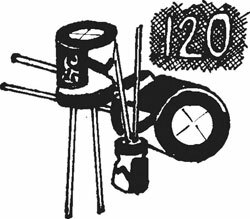 Our package of 120 radial lead electrolytic capacitors comprises: (15) each of 1uF, 2.2uF, 4.7uF, 10uF, and 22uF at 50V, (15) each of 47uF and 100uF at 25V, and (5) each at 220uF, 470uF and 1000uF at 25V. From Velleman®. 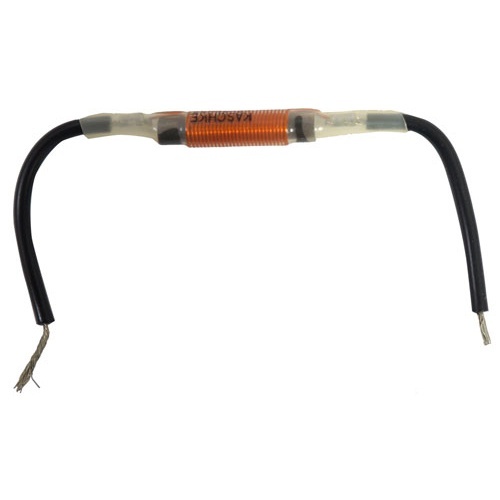 These 15uH chokes are encased in clear heat-shrink tubing with pre-soldered jumper leads. 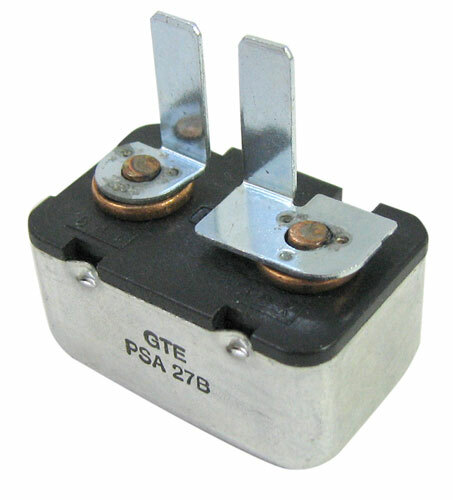 Rated for up to 4A and measure approx 4-1/2" long. Made in Germany. 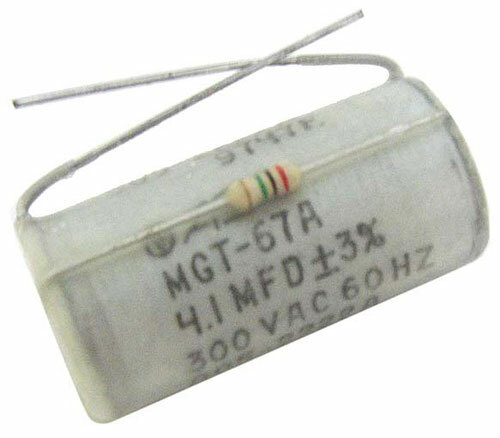 This thermal fuse has 1.6 ohm resistance at the terminals, so at 6V should handle up to 3.75A. Housing measures 1-1/4" x 3/4" x 5/8" with a pair of 3/16" terminals on the bottom. Normally closed. 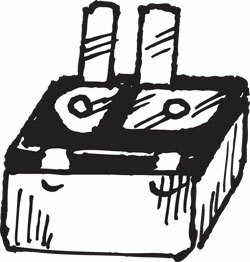 Made in the USA in the early '90s for use in a Power Wheels® battery in a Super 6™ Volt Vehicle models 85000-85999, PP940 AND PP941. 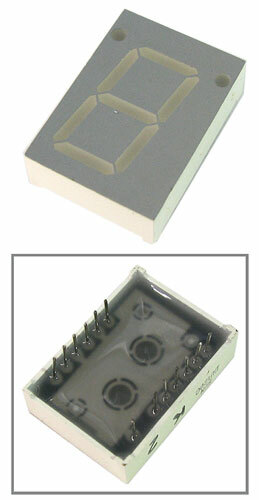 These single-digit displays with (8) LED segments in a DIP draws approx 150mA between 1.5 and 2.5 VDC. 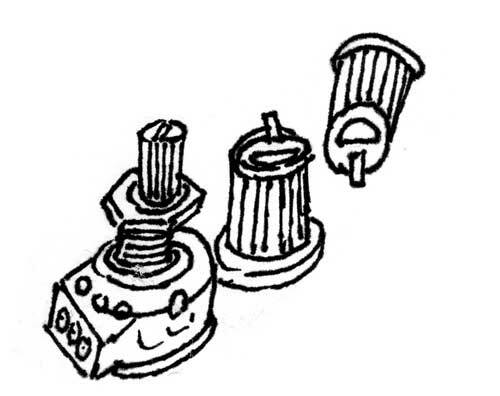 This is numeric because some segments' pins are internally shorted. Common cathode ground. Yellow segments. 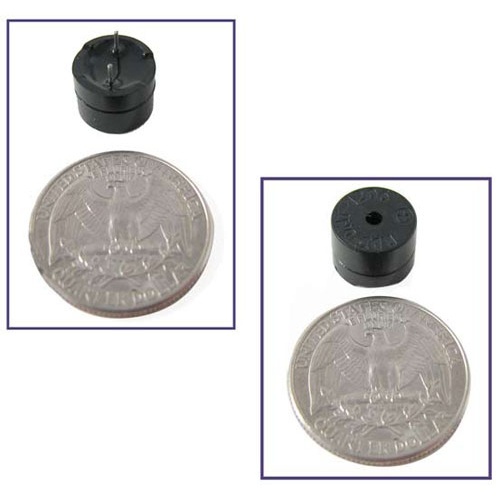 Measures 28mm x 17.5mm with 13 pins. 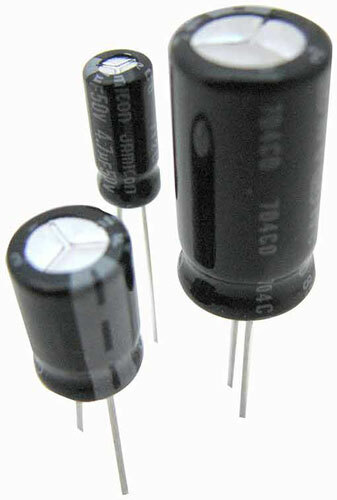 A 4.1 MFD 300 VAC capacitor. 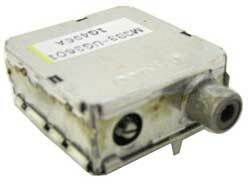 Only 1-5/8" long x 3/4" dia., the MGT-67A P.C. mount capacitor has a resistor mounted on its side. Good things come in little packages. 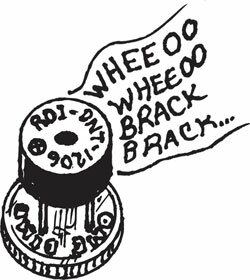 In this case the package is a 1-1/4" x 1-1/4" x 1/2" modulator, and the good things are a circuit board with at least a trimpot, electrolytic capacitor, assorted coils, 3-pin connector, RCA plug and (2) pop-off covers. Have a blast. This little (12mm dia x 8mm thick) transducer makes that ultra-annoying buzzing modem sound, because it's made for a modem. 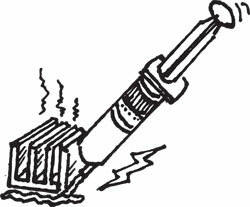 Apply a square wave signal in the 2200Hz range at approx 6V and it will buzzerate for you. Well, who wouldn't? Sound pressure level is about 85dB, 80 Ohm impedance. Housing is marked for polarity. Printed on the top is RDI-DMT-1206. 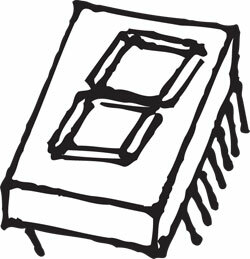 Application notes are at www.microchip.com, reference AN655.